This article will show you how to produce your own display labels at home from a wide range of customizable options. GW Acrylic display products are the recommended pairing for final display as they have been tested hand-in-hand with these labels. 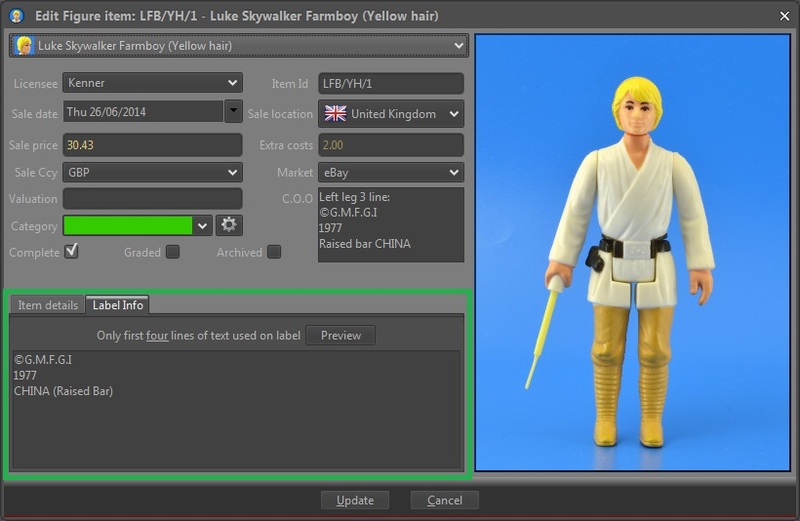 Note: Label image files can only be created using the Star Wars Tracker desktop application. Login to the desktop application and go to the Portfolios area within the My Tracker menu. 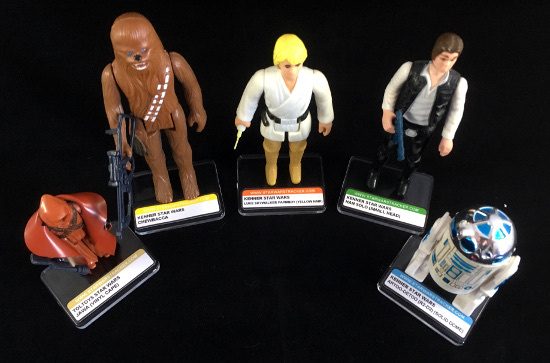 To generate a label, you must first have some entries in your portolios, so if you have not done so - now is the time to start adding your collection to Star Wars Tracker! Providence information, or even a note that this is a childhood figure! You can provide up to four custom lines for a loose figure and three lines for a mint-on-card (MOC) label. Next, click the Preview button to choose from various label display options. 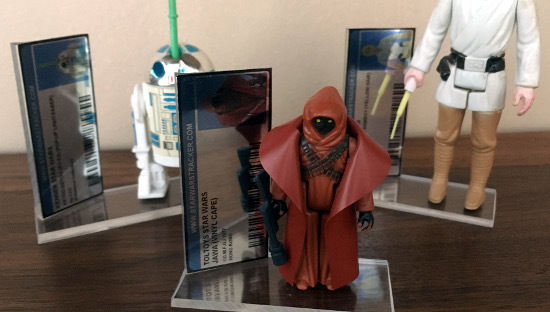 There are four main label sizes for a loose figure, two of which are designed to fit perfectly with GW Acrylic AFS-10-R deluxe figure stands. The preview is an accurate representation of the label and will update automatically as you test out various settings. Note that if you declared custom label information, it is also included and displayed in the preview. When you are happy with how your label looks, export it to the required JPEG file and move onto the next one. Repeat until you have finished creating all your label image files. Note: You will need some basic graphics processing software, a home printer and sticker paper to produce labels. By now you will have produced a number of JPEG files containing your label images. Instead of printing each one individually, to make most efficient use of your sticker paper it is recommended to arrange these individual images onto a single A4 sized image to print in one go. 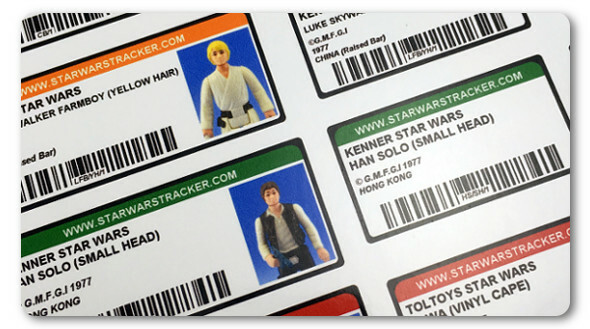 Star Wars Tracker labels are produced in high-resolution 300dpi (dots-per-inch) format. Basically this means they will look great when printed. It is recommended to use decent graphics software to arrange and print your labels at 300dpi. Unforunately, Microsoft paint does not respect the required 300dpi settings and did not produce good results in testing. However, GIMP is an excellent free photoshop alternative perfect for the task. 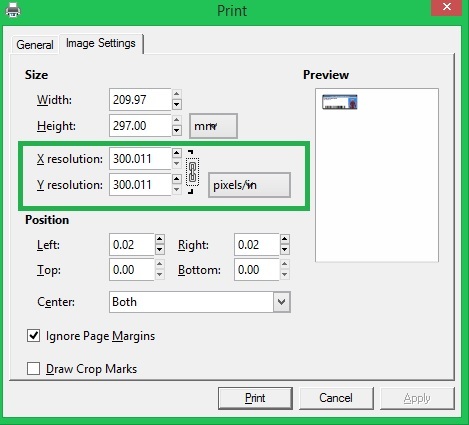 For best results, use this blank A4 size 300dpi printing template to arrange your labels on. Load it up in your graphics software and arrange your labels on it. This will help ensure your labels are printed at the desired 300dpi. Tip: It is recommended to do a test run for a couple of labels on blank A4 paper to check final print size is as expected. You can even do this in grey-scale to conserve coloured ink. You will know if your printing was successful if the labels measure the same sizes reported on the label preview screen. 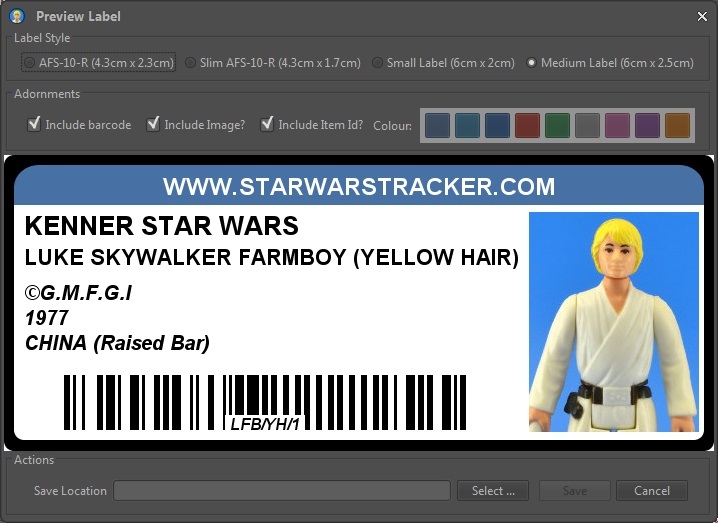 If you are unsure how best to print your labels at home or just need a bit of advice, then please let us know at support@starwarstracker.com and we can help guide you through it. When you are ready to do your final print run on sticker paper, it is highly recommended to inspect your print preferences and choose the highest quality settings. 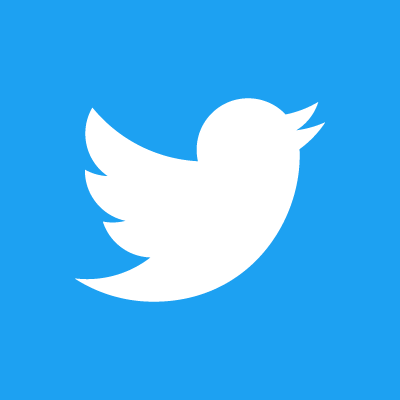 In testing this dramatically improved the clarity of the printed font and image resolution - it just looked so much better. So be sure to go best quality! For our testing, selecting the above settings on the printer preferences screen made a big difference to the final print results. 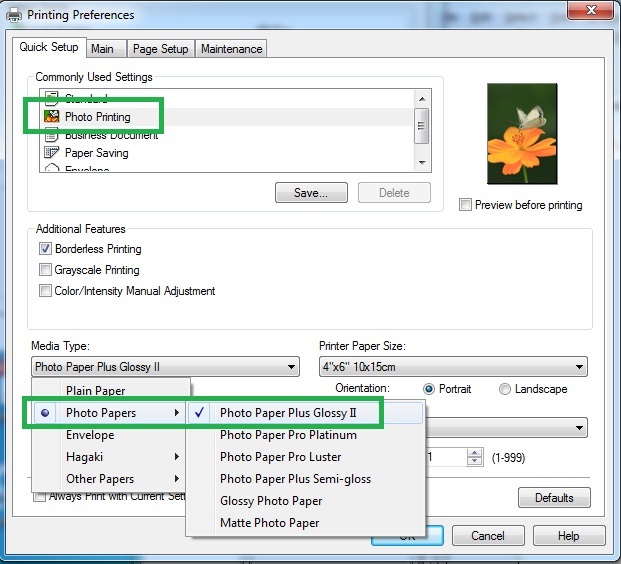 It is also wise to check the page/image print properties and ensure that printing will take place with 300dpi. Creating your own labels is very economical - you can get 20 or 30 of the biggest labels on a single A4 sheet. So feel free to experiment with various kinds of paper and designs. Finally ... What's with the Barcodes? You have the option of including a barcode that identifies the exact portfolio record for your item in Star Wars Tracker. With the iOS or Android app, you can scan this barcode directly from your smart phone to bring up the portfolio item record!